He wasn't supposed to be in Peoria until March. Until then, Peoria was merely a city by a river, dissected by a winding interstate leading to basketball venues around the state. He wasn't supposed to be in a Peoria hospital, either. He was destined to play at a basketball arena a few blocks to the south. But he's been in Peoria for nearly two months. Peoria is where he was poked, jabbed, overflowed with medicine, and where tears ran freely. Peoria is where he lost his feet and hands in an operating room. And Peoria is where Jason Wessels nearly lost his life. "Ten hours," said Jason from his hospital room last Sunday night. "The doctors once gave me just ten hours to live." "But I've stayed strong. God's been there for me. I owe my life to God." It's been an incredible ordeal for the Galesburg High School senior who also played basketball for the Silver Streaks. And it all started off innocently enough with a trip to the movie theater on Christmas Day. "Titanic," said Jason. "That's what I went to see with my girlfriend but I got real sick. All of the symptoms were just like the flu: vomiting, dehydration, fever. I had to leave the movie before it ended." Wessels went home and slept fitfully for a few hours. Jason's mother, a Licensed Practical Nurse, took some steps to lower his 104 degree temperature. But when he got up and tried to walk, he noticed he didn't have any feeling in his feet. "That's when I noticed the purple rashes on my body," said the Streak guard. That's when his mom took him to the emergency room. Emergency personnel at Galesburg's OSF St. Mary Medical Center noticed the spreading rash, too. They flooded Jason with antibiotics and called for an immediate airlift to OSF St. Francis Medical Center in Peoria. They took a culture but had to wait for results-- suspecting he had mononucleosis and afraid that it could be meningitis. They were right on both counts. Jason was a victim of a rare form of bacterial meningitis. "One of our doctors here in Peoria said that the people at St. Mary's saved Jason's life because they diagnosed it so quickly," said Donna Cooley, Jason's mother. Jason was still conscious at that point and remembers the helicopter flight to Peoria. "The pain was getting so bad, I was hitting the nurses asking for pain pills, I was swelling up in a lot of places." said Jason. "But once I got to the emergency room in Peoria, I don't remember a lot." Jason remained for days in intensive care in very critical condition. He turned purple from the blood poisoning. His nose swelled up to the size of a baseball. "I was on so much medication, everything was a blur the first few days. I'd wake up and think about watching the Rose Bowl and the next thing I knew, it was the next day and it was over. I couldn't keep track of the days. They would ask me what day it was and I'd always answer that it was December 26th." Jason doesn't remember his teammates visiting late at night after playing games in the Bloomington-Normal Holiday Classic. He doesn't remember Coach Mike Miller bringing him the trophy the Streaks won. And, of course, he doesn't remember how the team reacted so emotionally to seeing his condition through the glass in the ICU. "I'd see the cream on my rashes and would think, 'Hey, it's gonna clear up,' but then things got worse." Meningitis of this type is so rare that over ten specialists in Peoria treated and consulted on the case as Jason's life hung in the balance. Cooley says doctors from around the nation were consulted at all hours of the day and night. Despite their best efforts, the blood poisoning associated with the meningitis continued to spread from his outermost extremities towards his torso. While Jason's family had been warned that loss of limbs was very possible in cases this severe, they held out hope that his legs and fingers could be spared. Nurses, therapists and Jason's mother continually applied creams and lotions and exercised his feet and fingers to get the blood circulating once again. According to Cooley, they were warned that his fingers could just fall off-- a process known as self-amputation. "That really scared me." As time progressed and there was no circulation returning, the doctors advised the family that amputation of his limbs would be the only measure that would keep Jason alive. 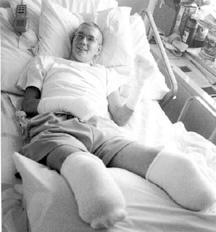 "Signing that permission form for amputation was the hardest thing I've ever done in my life," said Cooley. And after a discussion about who would be the bearer of such bad news, the doctors were elected to give Jason the word. "When the doctors told me, I think I cried for 24 hours," said Jason. "The first thing I thought about was basketball and my hands. To be able to touch the ball, hold the ball, pass the ball. That was what bothered me the most." "The hardest part was waiting for the surgery. I just kept thinking, 'Please get this over with. Put me out. Get it over with.'" And they did. They removed both his legs below the knees and all but small parts of two of his fingers. But after those dark days of January, things started to get better for Jason Wessels. His health took a turn for the better. And he wasn't alone. Not by a long shot. First was the support of his teammates and Miller. "I love those guys," said Jason. "One of the first things I remember is Pat Hanlon in my room with a guitar singing "The Hanukkah Song" by Adam Sandler. Between him and Rod Thompson, those guys made me laugh a lot." "Kevin Heimann spent the night with me last week. Toby Lannholm, Steve Glasgow, Nick Young, everybody has been supportive. Joey [Range]gave me his crown from the Sweetheart Swirl dance last Saturday night." Then there was the outpouring of support from the Galesburg community. "We get cards from people who we've never met," said Cooley. "Jason spends an hour every day between therapy sessions just reading his mail." "Basketball fans and the people of Galesburg have been great," Jason said. "I hope that I can thank everybody in person someday for what they've done." "Other schools have been supportive. [Rock Island coach] Duncan Reid came up to my room and said his team was praying for me. The Bradley basketball team came up here. The Chicago Bulls sent a package with stuff in it." Jason has enough credits that he's graduated ahead of schedule but he still wants to go back to school, if doctors will let him, just to get back into the flow of things. "I plan on going to college, either to a four-year school or maybe for two years at Sandburg, just to let things get back to normal. But eventually, I'd like to be involved in athletics, as a coach or in some capacity. My background in athletics has helped me a lot. The doctors say I'm ahead of schedule in terms of my rehab." Jason goes to Shriner's hospital in Chicago March 6th. There, they will assess his physical condition and recommend prosthetics. Once he's fitted for his new limbs, he should be able to do most of the things we all take for granted. "I'll be able to feed myself, dress myself and drive. [Baseball coach] Gary Bruington knows a race car driver who lost his left hand and he's coming to visit me with some samples of artificial hands. He drives cars over a hundred miles an hour." Wessels attitude toward artificial limbs has changed as the inevitability has set in. "As part of my therapy, they made me carry around an artificial leg for a day. I didn't like it." Erin Snyder and her mother, Dawn, principal of Lombard Junior High school, also stopped by to see Jason. Erin has a prosthetic leg, the result of a farm accident, and today is the manager for the high school girls basketball team. Cooley says Jason wasn't interested in talking to her about artificial limbs. Now he knows he needs to be. Ironically, Jason received a brand new pair of Michael Jordan sneakers for Christmas. "I wore them once before this all happened," laughed Jason "but I'll wear them again." To this day, Jason has no idea how he contracted the virus, only a theory: "We're thinking I may have gotten it at the Kiel Center in St. Louis when we played there in December," said Wessels. "We've heard there's been two other cases of it down there." Wessels was released from the hospital Thursday. A new ramp and front door have already been installed at his home­­ courtesy of local businessmen and several union laborers. He plans to be at Thiel Gym Friday for Senior Night. He spent a few hours at Sweetheart Swirl last Saturday night thanks to a four-hour pass. "Rod just about tackled me when I saw him. He hauled me out to the dance floor and said that it seems like years since he's seen me. I had Rod in a typing class and he was always turning off my computer, stuff like that. He's a great guy." Jason will be allowed to sit with the team on the bench. He also plans on traveling with them on the bus for road games in the Class AA Tournament. "Be sure to thank the fans for me," reminded Jason, from his hospital bed. "Please be sure to do that." When told he may get swamped with attention by fans Friday night, Jason smiled, saying "Getting swamped would be fine with me." Fans have always made Silver Streak basketball unique. And Galesburg, in its own Midwestern style, is pretty unique in itself. They take care of their own. They especially take care of their kids. Jason Wessels was special on the basketball court because of his unselfishness and desire. He's special off the court as well. He's got the courage of a lion. Last week was a Homecoming of sorts for Jason Wessels. First, the recently graduated Silver Streak guard and teammate Nick Young soaked in a night of excitement at the Peoria Civic Center as they watched WCW's version of "Thursday Night Thunder." That's where, just a few short months ago, the Streaks captured 2nd place in the Class AA basketball tournament. "We had seats about seven rows from the ring, right on the floor," said Wessels. "Then we went back towards where our locker room was and we saw all the wrestlers." "I think The Giant's leg was wider than my entire body," added Jason about one of the larger wrestlers in Ted Turner's stable. To cap off a thunderous evening, Wessels even purchased an NWO T-shirt. NWO means "New World Order." For those of you who believe more in soap operas than professional wrestling; the NWO is a renegade band of bad guy wrestlers led by Hollywood Hulk Hogan who are trying to take control of WCW wrestling from Turner and the good guys. This is serious stuff. But before coming home to Galesburg, Young drove Wessels to Saint Francis Medical Center, where Jason spent the better part of three months fighting for his life from a rare form of bacterial meningitis. It was his first trip back there since being released. "It was kind of not fun," said Wessels, who revisited the intensive care unit where he was-- at one point-- just given hours to survive. "But I didn't mind it that much. I just wanted to see the nurses again, to thank them." The saga of Jason Wessels didn't end with Galesburg's basketball season. His struggle, his fight, his raw determination hasn't stopped with Galesburg's championship loss to Whitney Young. Instead, Jason is still hearing from people-- not only in Illinois and across the nation but also around the world. A person from Cambridge, England saw the story about Jason's battle on the Zephyr website. His 23-year old daughter not only caught the same disease that afflicted Jason but was stricken at the same time in December. She also lost her feet and hands to the disease. "I still get a lot of letters," said Jason. "One last week was from Arizona. Another is from the East Coast." It's also very obvious that the people of Galesburg haven't forgotten about Jason Wessels, either. The YMCA recently had a fund raiser that not even Jason was aware of. "We're still touched by what people are doing," said Donna Cooley, Jason's mother. "A Knox sorority had a fund raiser at the Fleming Fieldhouse and Jason was able to go to that one." This summer, Wessels hopes to be the public address announcer for the Galesburg Post 285 Legion baseball team, a similar duty he had with the Streaks. He's slated to go back to the Shriner's Hospital in Chicago on June 19th for a medical consultation and to set up surgery for his hands later. "I'd like to enroll at Knox College but I haven't been accepted there yet. Even if I am, I may not be able to make the first semester because of when the surgery is scheduled." 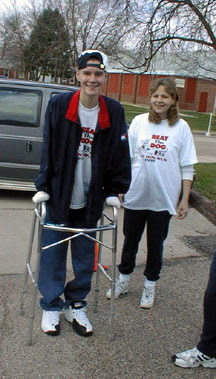 Wessels has adjusted extremely well to using a walker, allowing him to use the artificial limbs attached below his knees. "I get better every day and I hope to not even need it by the end of the summer." Thanks to Streak Booster Club members Bruce and Denise Foote, Jason and another Streak guard, Kevin Heimann, attended an NBA game in Indianapolis. "That was the game when the Pacers scored a record-low number of points," laughed Jason. "Reggie Miller was suspended for that game because of an elbow he threw at Vlade Divac. But San Antonio beat them pretty bad." "We wound up in what's called a Celebration Suite at Market Square Arena. That's where Reggie Miller called and I got to talk to him. We just talked basketball. And Dale Davis of the Pacers, I got to meet him and that was a thrill as well." About the only medical setback Jason has suffered since his release from Saint Francis was a kidney stone problem, which forced a one-day stay at a Galesburg hospital. "In the emergency room," Wessels added, "the nurses said, 'Not you again!'" Wessels has also been on the speaking circuit as he gave talks at Silas Willard and Lincoln Schools. He also spoke at the 1998 graduation ceremony at GHS. "I wasn't really nervous about it. In fact, I had it pretty much worked out in two hours as to what I was going to say. It came to me pretty quickly." And the crux of the speech? "Value your friends," answered Jason "and value your life." Who would know better than Jason Wessels?